Could Sunshine on Leith, the new film using the songs of The Proclaimers, be Scotland's answer to Mamma Mia? Scottish actor Peter Mullan, famous for his roles in films such as My Name is Joe, Neds and Tyrannosaur, is not known for his singing. In fact, there have been critics who say he can't carry a tune at all, one even comparing the sound to whale noise. 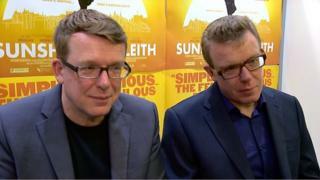 However, Edinburgh's most famous bespectacled twins - Craig and Charlie Reid - claim that when he growls his way through their song Oh Jean, it sums up everything that is right about the new musical film Sunshine on Leith. "It's not so much whether he is hitting the notes or not hitting them," says Craig Reid, praising the actor's timing and delivery. "He nailed it. He's the personification of why this film works because it does not feel daft him doing it. "He's at the 25th anniversary party and he just goes into it and it does not feel crazy." Despite 25 years of chart success and a string of anthemic hits, the Proclaimers would not have been an obvious choice for a screen musical. But while hit shows using the songs of Queen and Take That have stayed on the stage, and the Spice Girls' Viva Forever proved very short-lived, Sunshine on Leith is making its big screen debut. The twins only feature in the film in a five-second cameo role but 13 of their songs are sung by the cast as the plot sees two young Scottish soldiers, Ally and Davy, returning from Afghanistan and trying to find their way back into Edinburgh life. It is a romantic comedy with Proclaimers songs providing the soundtrack as Ally hooks up with his mate's sister Liz and Davy falls for her friend Yvonne. Davy's parents Rab (Mullan) and Jean (Jane Horrocks) also provide a touch of heavyweight acting and pathos. Big Proclaimers hits I'm Gonna Be (500 Miles), I'm on My Way and Letter from America crop up in the appropriate place, alongside many lesser known tunes from their back catalogue. The twins say they are not usually big fans of musicals but are proud to be associated with a modern Scottish "play with songs", as they prefer to describe it. However, they are aware of the comparisons with Mamma Mia, which used Abba songs to tell the story of romance and reunion on a Greek island. But while Craig and Charlie can see why the inevitable comparisons would be made, they are keen to highlight the differences. Firstly they say that in Mamma Mia, the beautifully crafted songs are sung "like angels" by the females in the group and the film's cast are not as good as the original singers. In contrast, The Proclaimers, who dismiss their own singing as "pub-style", are full of praise for the vocal efforts of the Sunshine on Leith cast and the musical director who have taken their songs apart and rebuilt them with new arrangements. They are especially pleased with the female actors who bring a "sweetness" that was never present in their work before. Craig and Charlie say the version of Sunshine on Leith sung by Jane Horrocks would "bring a tear to a glass eye". Then there is the actual script by Stephen Greenhorn, who first devised the musical for Dundee Rep back in 2007. Craig Reid says: "The quality of writing is better than Mamma Mia. Stephen Greenhorn is really good writer and he grew the story and the script out of the lyrics of the songs. "So that's why they fit better. They are just helping you continue to tell a story and they are not grafted on." Kevin Guthrie, who plays Ally, says he was a fan of the Proclaimers before the film but his appreciation has grown after taking on their songs. He says: "The genius of their music is that they come across as pub singers whereas in actual fact they are almost like classically-trained singers. "They have the kind of range that not a lot of their peers have. They both have that range and that's what is so unique about them I think." Despite being a very Scottish film, it was directed by Londoner Dexter Fletcher, who made his debut with East End gangster film Wild Bill two years ago. He says: "My first jumping off point was to see if these people were real and were the songs telling their story? "The writer is Scottish and the songs are about Scotland and it's set in Edinburgh. "I tried to let the film do its own work in terms of being Scottish. I was very mindful of trying not to create an outsider's point of view or trying too hard to be Scottish." He adds: "I am on a winner in a way because these songs are ingrained in the Scottish psyche and that's where they come from, so I could let them do the work in a lot of respects." The twins agree that it is as "real as a musical can be". Charlie says: "It is still strange to see someone burst into a song in the middle of a street in Leith but it does not feel incongruous to us." Craig adds: "It seems like the Edinburgh of today. It feels completely up-to-date. It is not sentimental. It is not backward-looking. Musicals by definition are not real but of any musical I've seen, it's the most believable." Sunshine on Leith is on general release on 4 October.